Unfortunately my health took a serious knock and didn’t allow me to keep updating this post or even do much work for months. Here is an idea called jfGi I’ve been working on, from bed on my mobile that has turned me into somewhat of a Bitcoin maximalist. www.jfGi.cc which means ‘just for Getting it’, ‘just for Giving it’, ‘just for Growing it’, ‘just for Gathering it’ and ‘just for Gaining it.’ The cc domain represents cryptocurrency but it is focussed on only Bitcoin at this point in time. Read about where the jfGi idea came from here. I hope you’ve been continuing to #learn11 in my absence. I don’t think I’ve ever read as much as I have since I became interested in crypto. If you’re not learning (reading, listening, etc) in this industry, you’ll be left behind quickly. If you’ve been following along the #learn11 educational journey on twitter you’ve already created & verified your accounts on coindirect & luno. Using the acrypto app to measure the results of #learn11. Continue your research by finding more about the other 9 cryptocurrencies below. Things aren’t looking wonderful in the wwworld of crypto if you started on your educational cryptocurrency journey in 2018. Web AddiCT is still up 195% since buying my first Bitcoin last year. We’re part of the #hodlgand… Keep buying a fixed amount of crypto with fictional fiat, we’ll be moon in January 2019. 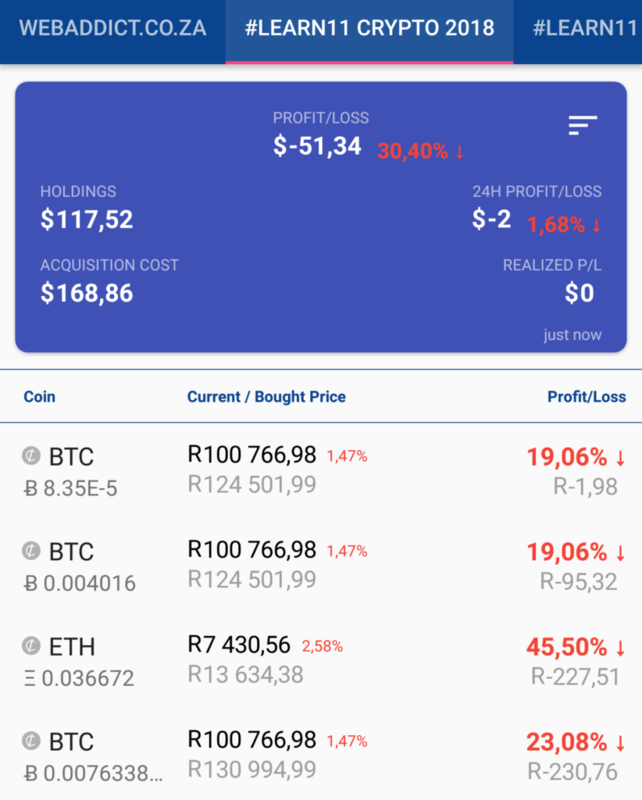 I’ve discovered another South African Crypto Exchange called ice3x. A proudly South African Bitcoin Company allows you to buy ETH, BTC and LTC there with EFT. Check it out. Education is the most important aspect of Bitcoin and other cryptocurrencies. It’s what you’ll spend most of your time doing, research. #DYOR: Do Your Own Research – Rick talks about the trend of hodling bitcoin, and why this is a disastrous move when trying to grow a new currency. Connect with Rick on Twitter. 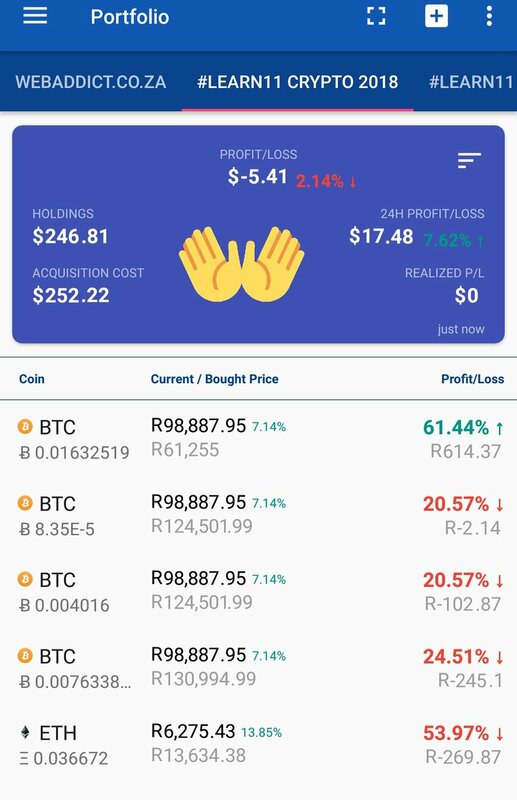 luno account and then bought R500 Ethereum(v), R500 bitcoin(ii), no you do not have to by a whole bitcoin or ethereum and gotten the R10 free bitcoin! Why only the 2, bitcoin and ethereum? Patience & next month we’ll need that eth or btc to acquire the other tokens/coins. Learn crypto in 2018 with these 11 cryptocurrency tokens: SingularityNET (AGI) Bitcoin (BTC), Civic (CVC), Dopecoin (DOPE), Ethereum (ETH), Finom (FIN & NOM), Litecoin (LTC), Potcoin (POT), Prime-XI (PXI), The Hemp Coin (THC) & Coin Magi (XMG). Do you hodl in a hardware wallet or trade on the exchanges?